Zapr was recently featured in the November edition of the Indian Business Journal. The article explores how the fast-growing-media-technology startup has become the world’s largest media consumption repository today. 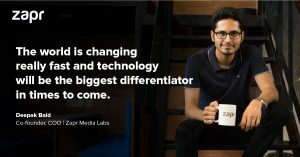 Deepak Baid, COO of Zapr Media Labs, talks about his five business and management mantras, including the need to constantly innovate in a fast changing world and how thinking ahead can help sustain a lasting business.